Buying a tequila you’ve never tried before is always risky. Grover and I have come up short many times (remember Chaya? Ouch.) But while in San Francisco last week I couldn’t help but search for some new tequilas at one of my favorite local liquor stores, Cask. Cask has a nice, well-edited selection and I came home with a brand I’d never seen before called Calle 23. The sales lady said that the tequila was created by a French scientist and the reposado was the most carefully crafted. Needless to say, I was intrigued! And, at $27 a bottle, the price was right. I smuggled the bottle home to Mexico, hoping that after the first try it wouldn’t sit ignored on our bar like a redheaded stepchild. Grover and I finally cracked it the other night, and to my relief it was a pleasure. It smells of cooked agave, light oak and hazelnuts. Its one flaw is that it carries an acetone note, but it is not overwhelming. It tastes better than it smells. In the mouth, it is light, but not watery and delivers a buttery mouth coating and a tingly finish that serves as a welcome reminder. Aged eight months in old bourbon barrels, it is flavorful but not overly saturated with wood—just as a repo should be. The agaves are sourced from the Highlands of Jalisco, although the distillery is located in Guadalajara. Unfortunately, I couldn’t find any other information as to the scientific crafting of this tequila, other than the fact that the brand owner is a biochemist. 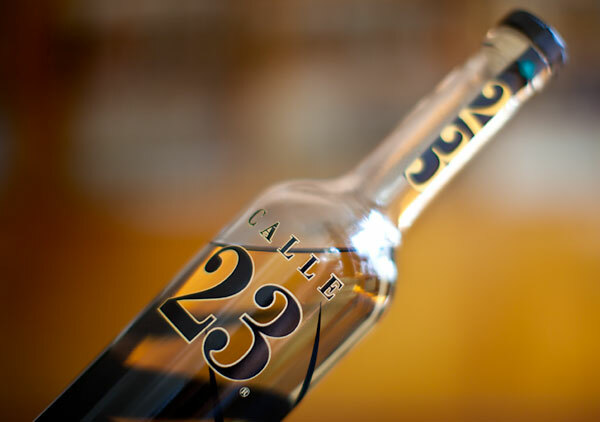 Calle 23’s tagline is “Tequila makes you smarter” and well, we couldn’t agree more, so If you work for Calle 23 please contact us and make us smarter about your tequila! Now, I wish I had grabbed the blanco and añejo as well. For the price, this really is a good buy and an agreeable sipping companion. You can buy it online at ForTequilaLovers.com. Ca. also told be about this brand. The science background of Calle 23 is actually interesting. I am not sure that another brand does what they do. The biochemist, Sophie Decobecq, created a different strain of yeast for each the blanco, reposado, and anejo. Also one of our original bartenders from Tres Agaves is involved in the concept and marketing of that brand. Send me an e-mail if you would like some contact info on them, or perhaps we could coordinate a tour for you two. I’m a BIG fan of “Calle 23”! It’s a classy brand created by Sophie Decobecq (based in GDL). All the ages are worthy — and it’s a funny thing about this brand in particular: While the first sips are pleasant enough — the juice REALLY starts to work its wiles on you in subsequent tastes. By the time you’re finished with a glass, you really want to fill it right up again! I spent a wonderfully “lost’ afternoon on the couch, sipping “Calle 23” and reading the history of Superhero comics while listening to Warren Zevon. I think that Calle 23 is probably one of the best values in the realm of alcohol.